It's hard to be just a little be fond of Philip Seymour Hoffman, a hugely talented actor who has neither the face nor girth of a typical Hollywood star, but who can easily carry a film and even steal it from under the nose of the headline stars. In 2010 he made his feature directorial debut with Bob Glaudini's screen adaptation of his acclaimed Off Broadway play, Jack Goes Boating, a tale of love, betrayal, friendship and grace centered around two working-class New York City couples. Two New Yorkers in search of their soul mates, Jack (Hoffman himself), a limo driver, and Connie (Amy Ryan – Gone Baby Gone), a funeral home worker, are two single people who on their own might continue to recede into the anonymous background of the city, but in each other begin to find the courage and desire to pursue their budding relationship. In contrast, the couple that introduced them, Clyde (John Ortiz) and Lucy (Daphne Rubin-Vega), are confronting unresolved issues in their own marriage. Being with Connie inspires Jack to learn to cook, pursue a new career and take swimming lessons from Clyde so he can give Connie the romantic boat ride she dreams of. But as Jack and Connie cautiously circle commitment, Clyde and Lucy's marriage begins to disintegrate. From there, we watch as each couple comes face to face with the inevitable path of their relationship. Hoffman and Ryan shine through in this bittersweet romantic drama as the late blossoming couple, with New York providing the perfect backdrop as their relationship plays out to a memorable soundtrack from the likes of Fleet Foxes, Grizzly Bear, Cat Power, Darondo and The Melodians. 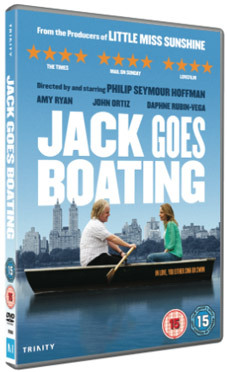 Described by The Times as "A beautifully acted study of two lonely souls" and Time Out as "An admirably heartfelt, insightful debut," Jack Goes Boating will be released on UK DVD on 27th February 2012 by Trinity at the RRP of £19.99.